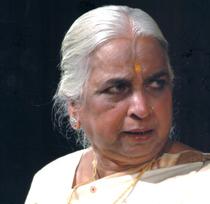 Girija Devi ( born,May 8, 1929) is an Indian classical singer of the Banaras gharana. She performs classical and light classical music and has helped elevate the profile of thumri. Girija Devi was born in Varanasi,on May 8 1929 to Ramdeo Rai, a Bhumihar Brahmin zamindar. Her father played the harmonium and taught music, and had Devi take lessons in singing khyal and tappa from vocalist and sarangi player Sarju Prasad Misra starting at the age of five. She starred in the movie Yaad rahe aged nine and continued her studies under Sri Chand Misra in a variety of styles. Devi made her public debut 1949 on All India Radio Allahabad, after getting married to a businessman circa 1946, but faced opposition from her mother and grandmother, because it was traditionally believed that no upper class woman should perform publicly. Devi agreed not to perform privately for others, but gave her first public concert in Bihar in 1951. She studied with Sri Chand Misra until he died in the early 1960s, worked as a faculty member of the ITC Sangeet Research Academy in Kolkata in the 1980s and of the Banaras Hindu University during the early 1990s, and taught several students to preserve her musical heritage.Devi often toured and continues to perform in 2009. SUR “Sublime Urge to Rejoice” established in 2014 and aims to spread finest arts to aficionado and lovers of arts. SUR’s founders engage in these arts’ services based on their experience of working in the field of arts over the years. Registered as a Non- Profit Trust no: 0197/2014/WB. As per Planning Commission NGO unique id: WB/2016/0095777.